The Vera Wang bridal collection has been availabe in Australia at Helen Rodrigues since 2003. In January 2007, Vera Wang opened her first shop in shop in Australia at Helen Rodrigues. The acclaimed designer, recognised as the authority for a modern, sophisticated approach to bridal elegance, partnered with Helen Rodrigues to offer brides the world of Vera Wang. 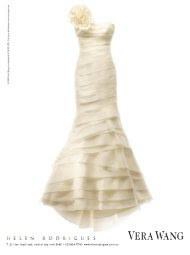 The shop in shop represents Australia’s most extensive range of gowns from the latest Vera Wang bridal collections. With exceptional service offered ‘By appointment only’, Helen Rodrigues ensures each bride receives their undivided attention with the entire boutique to themselves. Please call to arrange your appointment.